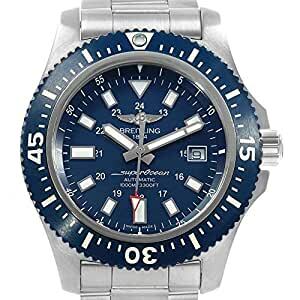 Breitling Aeromarine Superocean 44 Blue Dial Watch Y1739310. Automatic self-winding movement. Stainless steel case 44.0 mm in diameter. Stainless steel screwed-down crown and pushers. Blue ceramic unidirectional revolving bezel. 0-60 elapsed-time. Scratch resistant sapphire crystal. Blue dial with Luminescent stainless steel outlined hands and index hour markers. Date calendar window at 3. Minute markers around the outer rim. Stainless steel bracelet with deployent buckle. Fits 8 1/4″ wrist.. SKU 19430. Buy with confidence knowing each timepiece goes through the same rigorous 31-point inspection. Rest assured only authentic parts straight from the manufacturer are used. The Certified Pre-Owned Program on Amazon ensures peace of mind and transparency via standardized reports and a 1 Year Warranty Provided by WatchFacts.